Since LoPHAT Cabinets is dedicated to building the highest quality product that offers superior sound and flawless construction, our number one goal, since inception, has been to combine excellent design and exacting craftsmanship into a package optimized for the LoPHAT tone that every bass player deserves, whether it be at rehearsal, a gig, in the studio or practicing in your room. Software engineered to optimize the performance of selected components. Hand-crafted in our shop where every one is cut from amazingly light and incredibly strong 5/8 inch Italian Poplar lite ply utilizing dado joint construction. Crossed over, braced, ported and insulated for a smooth transition from thundering lows to sparkling highs. Covered in a highly durable finish of black polyurea, a polymer coating virtually unmatched in strength and abrasion resistance. 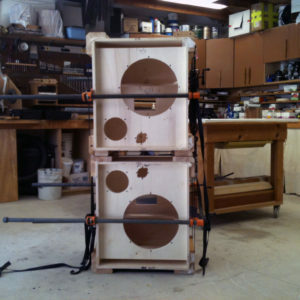 Finished with sturdy hardware that stands up to the daily riggers of load-ins/load-outs. Sonically transparent via the installation of a vibration-free steel grill. For musicians desiring flexibility in arranging their system, LoPHAT Cabinets are designed to be intermixed and stacked either vertically or horizontally. In addition, an easily installed/removed cart dolly is available to aid in transporting each LoPHAT Cabinet. Treble Control: The treble control gives 6 dB of boost or cut at 4 kHz (6dB per octave, shelving type). Middle Control: The middle give 6dB of boost or cut at 500Hz (wide Q, peaking type).Bass Control: The bass control gives 9dB of boost or cut at a selectable frequency of 60Hz or 120Hz (6dB per octave, shelving type). Presence Control: The presence control gives up to 12dB of deep boost at a selectable on/off switch (active type, 6dB per octave). Mode switch: Dark, is a high frequency cut fatting up your fundamental. Normal, flat operation showing off more overtones. Bright, brings out the overtones on the dullest basses or speakers. Internal Volume Trimmer: This control is designed to match the output volume of the LoPHAT-800D with the sensitivity of any Bass. 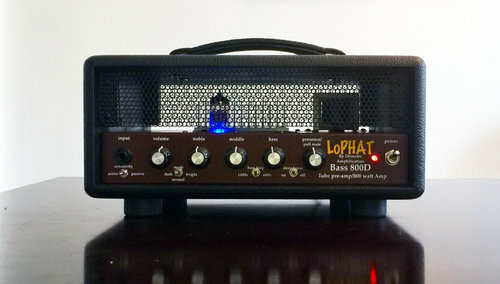 Optional, Studio Output: The LoPHAT-800D features a mic level Jensen DB-E output transformer for a balanced studio output. Inputs: one instrument level 1/4” jack. 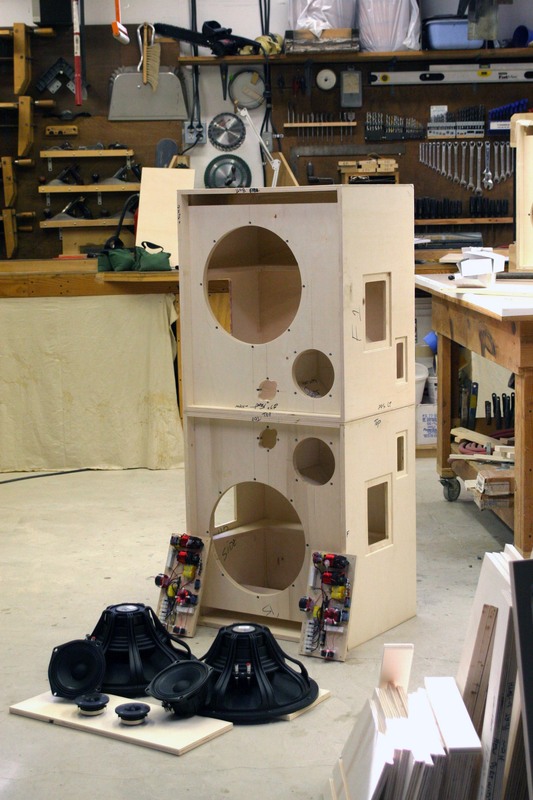 Paul Tidwell started building loudspeakers enclosures for customer orders in 2008. This laid the basis for his successful owner/designer-managed company. As a bassist, that ultimate sound one seeks was eluding him. So, Paul set out to search for the perfect tone and began to turn his own thoughts to audio reproduction. 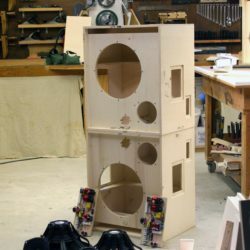 After purchasing a plethora of amplifier/cabinet combinations, never being completely satisfied, he found himself making his loudspeakers himself. In 2015 he began to dialog with James Demeter, and a short time later, he entered into a joint venture with Demeter Amplification and produced the first LoPHAT amplifier. The constant search and implementation of new ideas has quickly earned him and his products due respect. Within a few years The LoPHAT brand recognition has grown to be recognized internationally. Paul has been an exhibitor at the Winter NAMM Show in Anaheim since 2009, and has exhibited at Bass Player Live. His passion for music has again and again led him to achieve his highest goal: to authentically and perfectly put the bass in the limelight in all its facets. "Combining quality craftsmanship and superior sound in a lightweight package is our goal."